It’s undated but I’m guessing sometime in the ’70s based on the hair. You sure can’t tell from the bathrobes, which are relatively immune to fashion. 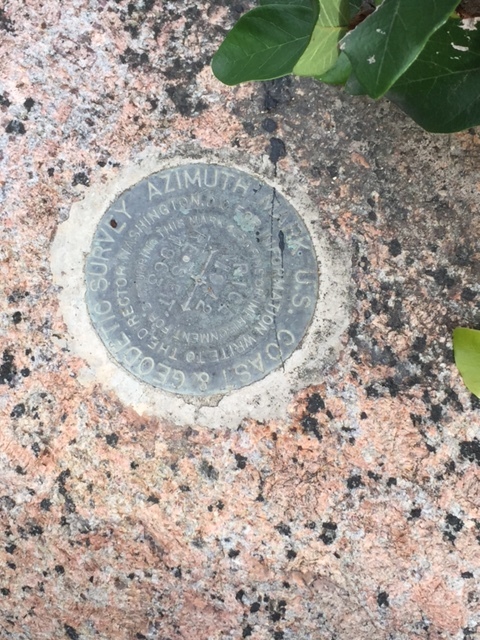 Bonus: A closeup of the azimuth marker! I think that is between Lovett and WRC. That looks like the back side of the WRC commons and the shed would be Sammy’s House. Looks like Lovett Quad with the owl cage in the back. I think this might be associated with Night of Innocence. I believe that started in the mid to late seventies, which would be about the right timing. The guy with the beard looks like Marc Hairston. Hi Karen. Marc reposted this on Facebook and isn’t sure what your last name is (no photo here on your comment). You can catch up with him there. Yes, that’s me in the picture. This must have been taken just before the second Night of Innocence in October 1978. We were more organized the second year and more folks wanted to join in. And that’s why we’re all in our pajamas and bathrobes. Unfortunately the picture is so blurry I don’t recognize most of the folks in there (other than they were all Sid Rich members). I think that’s Mike Drews at the top with the cap. Are you able to post it on a specifically Rice group on Facebook or on Classmates.com? People who recognize themselves might comment. Your Arthur Dent impression is priceless! Definitely. That is Dr. Marc Hairston. Who are all these other folks, please? The picture looked familiar to me. I think it may have been in the Campanile. If I have time, I’ll see if I can find it. It might be a better image, and it might be possible to identify others. It’s possible that a negative exists and if so I can get a clearer image from that. I’ll check on Monday.